I knew I’d drink plenty of tea in China: it was a literate, delicious, and caffeinated way of connecting with my new country. I already loved all of these things about coffee, having grown in college from a Frappuccino-drinking dilettante into a relentless addict who favored straight espresso after a stint in Switzerland. I thought a year in China would see me fall just as swiftly for tea, but it would be more correct to say that tea caused me to develop a taste for China. You can learn a lot about this huge country in very small cups. Tea has also reflected my personal experiences in China. You need a dexterous mouth to drink from a cup full of leaves (teabags are for sissies here), just as you will to eat bony meat and fish. Tea houses have been a great setting for getting to know Chinese friends, practicing my Mandarin, and stimulating conversation – those last two not always simultaneous. Most importantly, the incredible hospitality I’ve been met with has often been accompanied by a cup of tea. People and motorists on the street can have a lot of hustle and little manners, but once you make a personal connection in China, prepare to be overwhelmed with offers to take you out to dinner, hosted at family meals, pressed with gifts (of tea), and asked to please, please sit down and have some tea, since standing and talking feels too aloof to them. The peak of my experience with tea culture was a pilgrimage to Hangzhou and nearby Longjing Village, home of arguably China’s most famous tea. 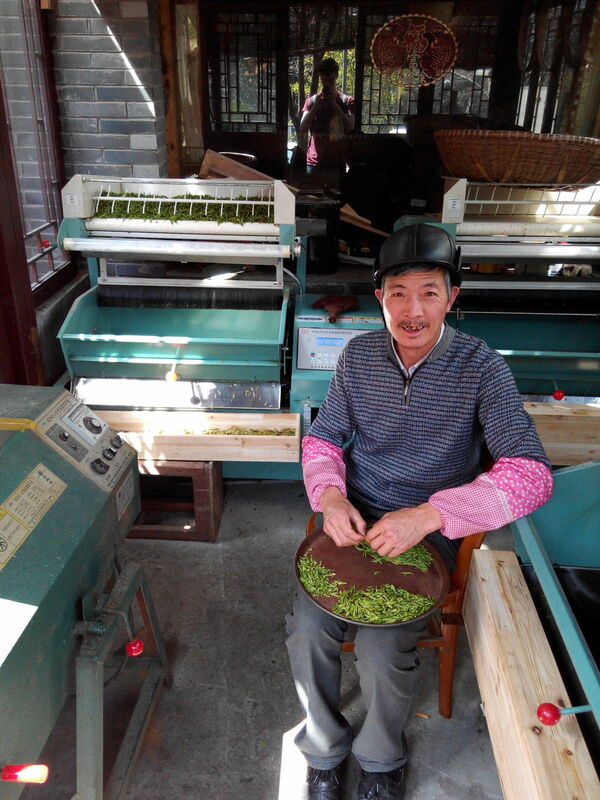 By pure, dumb luck, I arrived on the best weekend of the entire year to sample and buy tea: the weekend before the Qingming Festival, when the youngest and highest-quality tea leaves are being harvested. That trip showcased everything I love about living here: cheap, blindingly fast high-speed rail that delivered me right to the city center; friendly teams of tea-picking old ladies that insisted on giving me oranges; excited 20-somethings that wanted to be best friends; a blend of natural and artistic beauty; and the inexhaustible thrill of swimming in another culture. Of course, I haven’t left coffee behind. I’m still very much an American, who buys his beans at Starbucks and brews them every morning in his French press. Tea and coffee coexist in my pantry, just as they do in Chinese society at large. I split my time between the expat gathering place of RJ’s Coffehouse and the tea houses on the other side of Hongmei Park. Nearby on Yanling Road, there are three Starbucks stores, which depending on your prejudices, reflects globalization by American firms, Chinese obsession with foreign things, or the universal appeal of coffee. There is also a wealth of local coffee outlets, including the cat cafés where you can get a cat-uccino. This is cultural diffusion at its best. If you’re a prospective AYCer, you can’t know what you’ll become attached to in China. The difficulties in moving abroad are always more apparent than the benefits. But that can be all the more reason to do so: aren’t you the sort of person who wants to be exposed to the totally foreign, strange, and new? I studied Chinese history, politics, economics, and language for years before coming here, but it was only once I employed my other senses – taste foremost among them – that I developed a personal connection to the country. Like tea, culture is something you need to try for yourself. Are you thirsty?